Simple and easy installation: settings and configuration done by the terminal menu screen. 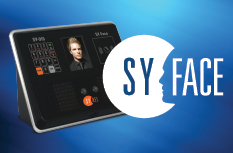 Attendance and Access: Synel SY-Face terminals are applicable for time attendance and door access. Fast and accurate identification: employee should only look at the device for less than a second he will be identified. Hygienic: Facial recognition technology does not require any physical engagement.